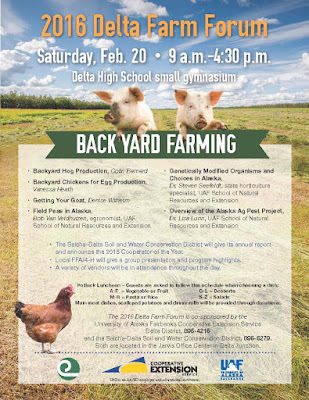 Backyard farming is the theme of the annual Delta Farm Forum, Feb. 20, in Delta Junction. The forum brings growers, producers and the community together to hear about agricultural research, recommendations and farm agency news. Presentations will run from 9 a.m. to 4:30 p.m. in the Delta High School small gymnasium. Three Delta residents will talk about backyard farming. Colin Barnard will talk about backyard hog production. Vanessa Heath will talk about raising chickens for eggs and Denise Wilhelm will discuss raising goats for milk and meat. Two speakers from the School of Natural Resources and Extension, Bob Van Veldhuizen and Steven Seefeldt, will talk about field peas in Alaska and genetically modified organisms and choices in Alaska. Dr. Lisa Lunn, the Extension veterinarian, will provide an overview of the Alaska Agriculture Pest Project. The Salcha–Delta Soil and Water Conservation District will give its annual report and announce the 2015 Cooperator of the Year. Local FFA/4-H will give a group presentation and program highlights and a variety of vendors will attend the forum. A potluck lunch is planned. The forum is co-sponsored by the University of Alaska Fairbanks Cooperative Extension Service and the Salcha-Delta Soil and Water Conservation District. 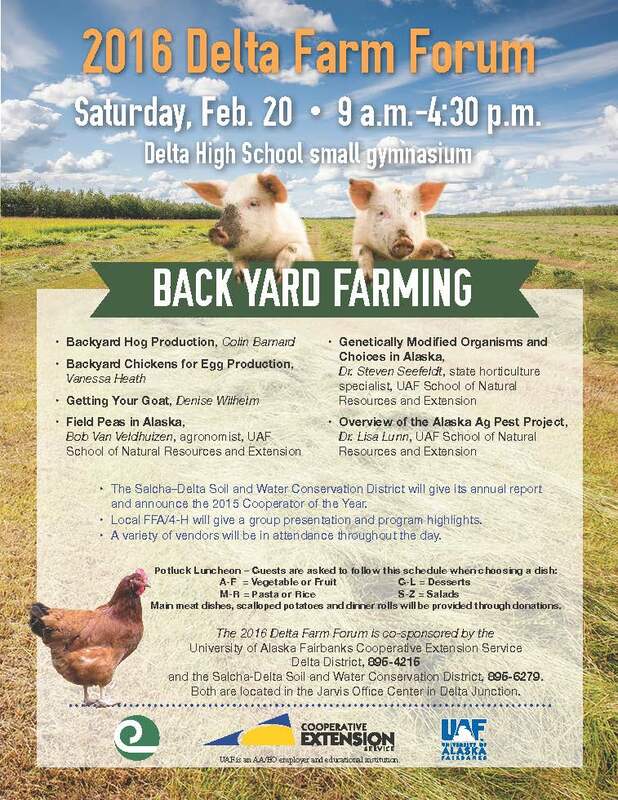 For more information, contact Delta Extension at 907-895-4215 or the conservation district in Delta at 895-6279.